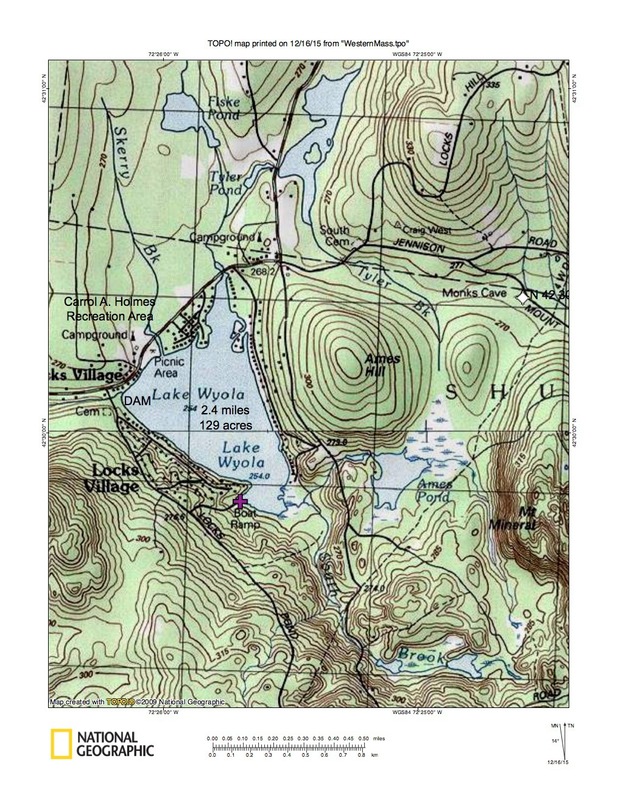 Lake Wyola is a good location to catch stocked trout, which are numerous. Chain Pickerel and Largemouth Bass, some in the 4 to 5 pound range, can also be caught in the vegetated areas of the lake. Smallmouth Bass are also present but in lower abundances. Lake Wyola has produced Largemouth Bass, Smallmouth Bass, Chain Pickerel, bullhead, and Brook Trout that meet minimum sizes for recognition by the Freshwater Sportfishing Awards Program. The bottom is predominantly mud with scattered areas of gravel. Aquatic vegetation is thickest in the north and south east corners of the lake and sparse elsewhere. The shoreline is 80% developed with year round homes and summer cottages. Swimming, boating and fishing are all popular activities on Lake Wyola. The gravel boat ramp is for all types of boats. 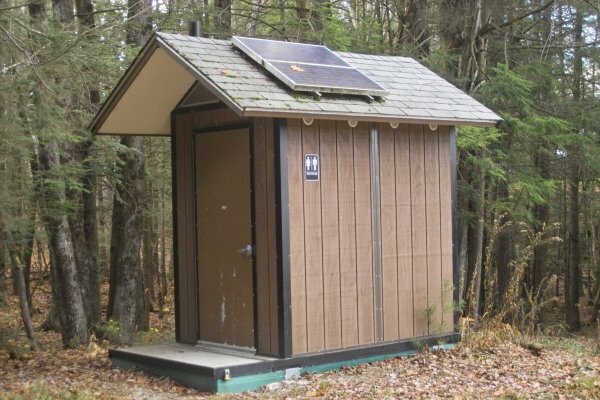 There is a restroom and a boat wash available as well as plenty of parking. At mile 1.9, at the stoplight, turn left on Route 47 North. At mile 6.6 Route 47 turns sharp right. At mile 6.8 cross Route 63 with a quick right then left on to North Leverett Road. Follow North Leverett Road through the town of Leverett. The road becomes Lakeview Road. Red Brook will be on your right. At mile 12.4 turn right on to Locks Pond Road. The outlet of Lake Wyola is at this turn. At mile 12.9 turn left on to the dirt Randall Road. There is nothing on this road except the boat ramp at the end. 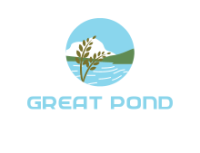 Gravel Launch for all types of boats. Construction was completed on a dam in 1883 that increased the size of the lake from 65 acres to 130 acres, doubling the size of the lake. 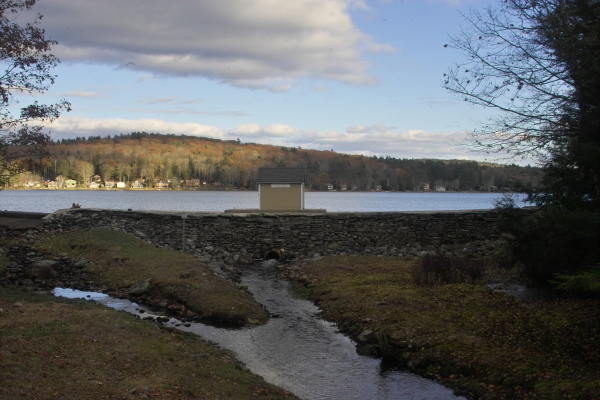 The dam was originally installed to help provide hydropower on the Sawmill River, then the site of numerous mills. Lake Wyola Dam is of earthen construction. The dam is a 232 feet long, 14 feet high masonry embankment dam with a concrete spillway. Its capacity is 833 acre-feet. Normal storage is 830 acre-feet. It drains an area of 6.4 square miles. In 1998 state officials classified the dam as a high-hazard dam. 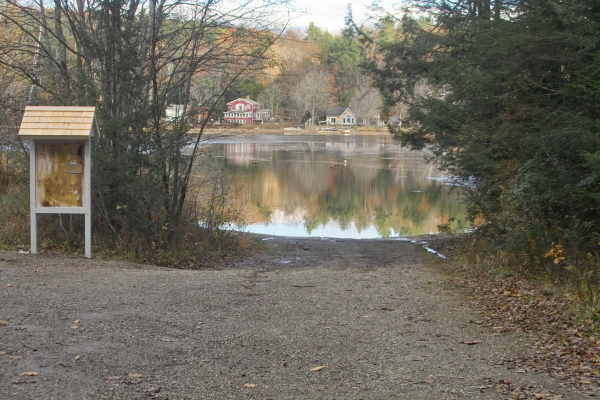 They said that there was a potential for a large loss of property and life downstream, in the towns of Leverett and Montague, if the dam should fail. In 2005 during heavy storms, there was great concern for its stability as the area directly below the dam severely flooded. In July 2008, despite the evident and urgent need for repair or replacement the Massachusetts Governor denied funding for the dam's repair. Many local residents, particularly in Leverett and Montague, were frustrated with the Governor's decision. However, with so many dams in Massachusetts in need of repair, others question if the state should be spending millions to rehab old dams. Despite the gubernatorial veto, funding was eventually obtained and construction began at the dam in the fall of 2008. The repairs were completed in May 2009. 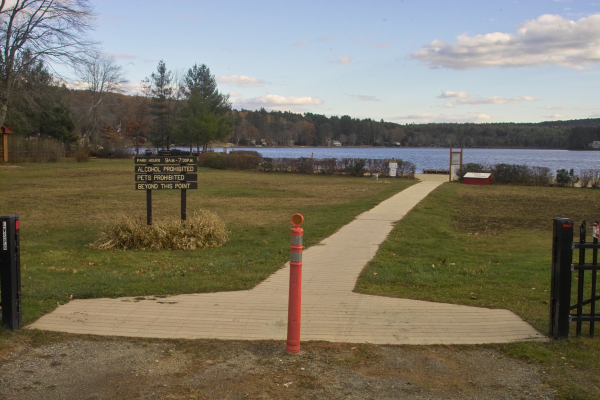 Lake Wyola State Park, also known as the Carroll A. Holmes Recreation Area, is located in the quaint hill town of Shutesbury, just north of Amherst. 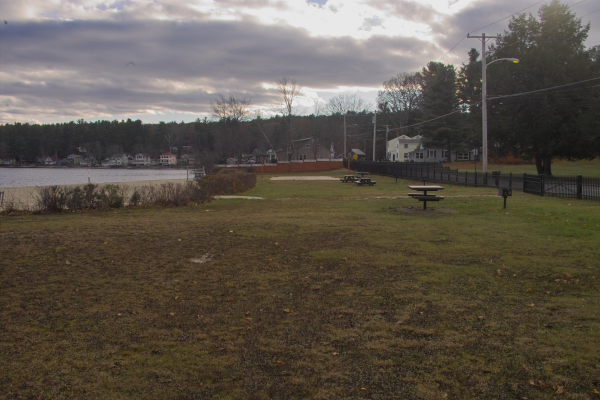 The Department of Environmental Management (DEM), now the Department of Conservation and Recreation (DCR), bought the former, privately run Lake Wyola Park from Emelia Bennett in 1997, and named it for Carroll Holmes, a former Shutesbury selectman and director of DEM's Region IV. This 40-acre day-use area is located on the shores of Lake Wyola, a Native American word meaning, “quiet waters”. Here on the crystal clear waters of the 130-acre lake one can swim at the guarded beach or picnic at one of the many picnic sites all with charcoal grills. Who made this chamber? Is it a root cellar or is it something else very ancient? The chamber is located in a steep sandy embankment along Mt. Mineral Road in Shutesbury, MA. It is has a small entrance to almost well like chamber. The chamber has a single large capstone with a corbelled sidewall to roof capstone transition. The chamber has different sections built with different styles or techniques of dry stone masonry, this makes indicate either multiple people building the structure or chamber built (or rebuilt) in several different construction phases. Speed limits on the lake are 30 mph during the day and 5 mph from dusk to dawn. The speed limit in both coves and close to shore is always 5 mph. No jet skis. No water skiing after dusk. Motorboats must stay 150 ft from shore and all swimming areas. Swimmers must swim within 150 ft of shore unless accompanied by a boat. All motorboats must comply with State and Coast Guard regulations for safety equipment. All boaters must have PFD’s. All boats must have lights on after dusk. Association beaches are for dues paying members only. Dogs and glass are not allowed on the LWA beaches. No lifeguards on duty. Children under the age of 14 must be with an adult on the beaches. Do not cast hooks in swimming areas.